conferences | Write Early, Write Often…Write Something! So. 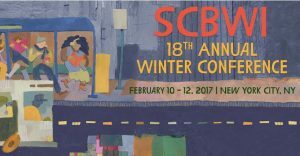 Four days out from the end of the 18th Annual 2017 SCBWI Winter Conference. I always feel like we are on timers and we have to get to this, move onto the next, then the next. And by the end on Sunday. Whew! Time to process. I love the keynotes. They are all inspirational in their own way. Each leaves behind a nugget. A tidbit to get me through the writing process. No, not going to share. I’m sure each person who listens hears their own nugget. The panel on picture books is always fascinating to me. I listen and am still star struck at what they are able to imagine to create a book of 32 pages that has so few words and yet conveys a whole story, emotion, life. A picture book is a wondrous thing. This year my two picks for Saturday breakouts brought more to my toolbox than I could have imagined. I go to these all the time. I listen. I take notes. I wonder two things: if this is an editor/agent that I could submit to and in the end, I usually say no. And, I pay attention to their presentation skills and if this is someone we could bring to our regional conference. Both were a yes on both–a first. The first editor used the Newberry Award Committee criteria as a prism through which to view middle grade. The first thing I liked was the discussion about middle grade. The editor stated that middle grade encompassed everything from Captain Underpants to Brown Girl Dreaming. Interesting. Do you know the Newberry Criteria? If not, and you are writing middle grade, then look it up. Here’s the short version: Interpretation of the theme or concept, Presentation of information including accuracy, clarity, and organization, Development of a plot, Delineation of characters, Delineation of a setting, Appropriateness of style. I am huge on show and tell, so the editor illustrated each point with a book and why, including short readings, which is cool. The second editor was unexpected. I had not realized this editor’s involvement in nonfiction. I had always thought in terms of fiction, which is why we hosted the editor at one of our conferences in Carolinas. I think when I checked that box I was more interested in title than I was in presenter. What did I get? The knowns: nonfiction is powerful, shows how to think, works for curious children and has a reverence for the facts. This house publishes commercial quality nonfiction. And mentioned was Capstone, Lerner, Rosen, Scholastic, National Geographic. The house like series, not unlike the success of the Magic School Bus, though not from this house. I think the thing that was most exciting about this presentation was that the editor delved into what would be almost Pop Culture nonfiction. And that versus the nonfiction I grew up with, there is now a push to have nonfiction reflect the 21st century. The Sunday panel on The Current Landscape for Children’s Books was more interesting than I thought it would be. One participant claimed that the ‘role of the gatekeeper’ is outdated. Now there is independent publishing, self-publishing, as well as publishing that comes from blogs, serialized graphic novels that form a platform for and a entry into traditional publishing. Also mentioned was that a large number, 55%, of young adult novels are now considered crossovers. Sheeze, I have been immersed in children’s literature for so long, I’m not sure I even see that, but there you go. 55%! Some new terms I learned in the publishing business. Editors/Agents are looking for empathy builders. They worry about marginalized readers. And, they use sensitivity readers to ensure that the books they publish that are of a diverse nature are accurate and appropriate. One very positive note. Ken Geist, VP Publisher [Orchard Books, Scholastic Press Picture Books, Cartwheel Books, Readers, Branches and Little Shepherd] stated that there is no doubt the picture book market is better than it has ever been! On the publishing side, there was also the note that the NYTimes has changed it list. And because I have not focused on that, I’m not sure I get the change. But one VP/Publisher was very concerned. So need to investigate. So. Good stuff. Time to review my own submission. Push the ideas that I have into a manuscript format. And of course, time to submit the manuscripts that have been so very vetted and are ready. Processing is a constant. I think I like that. This entry was posted in Art & Craft and tagged #NY17SCBWI, #tribeshare, conferences, SCBWI, submitting, writing for children on 2017/02/16 by teresafannin.